What are your Mason Bees doing right now? It feels like spring has finally arrived in the Pacific Northwest and mason bees are starting to fly. Thanks for all of our customers for participating in the Rent Mason Bees program! Now is a great time to check your Mason Bee house to see what activity is happening. Concerned there is no activity? Keep reading. 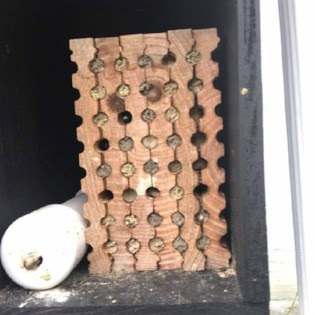 You will learn about the different stages from this article written by biologist, Olivia Shangrow from RentMasonBees.com. “Everyone’s backyard yard is a little different so bee activity levels can vary at this point in the season. 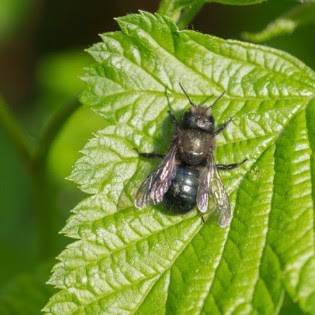 Male mason bees are the first bees to hatch. You may have seen a handful of small black bees flying out of your tube when you first released them. It can take anywhere from a few days to a few weeks for the females to hatch after the males. 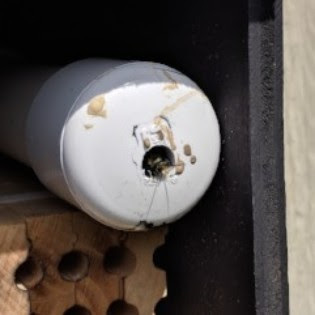 Those brown markings on the outside of the tube and house are scent marks. That’s how the males know where to come back to find the females. You may have seen a few males flying in and out of the white tube; they are checking on the hatching progress of the female bees. It is important that you do not wipe off the markings as it will confuse the bees. The males are also generally much smaller than the all-black female bees. They will forage around to find nectar to eat until the females have hatched. Male and female bees mate and then the males’ life cycles will be over. The females will fly for the rest of the spring season, pollinating your backyard while completing their egg laying process. Don’t be alarmed if you are not seeing a lot of consistent activity in your box yet. Once the females have hatched out, they will often leave for a few days while they are scouting around the area for good sources of pollen and nectar. 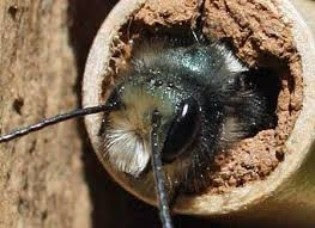 As long as your mason bee house is hung in a sunny location and they have access to clay-based mud for the season, some of the females will choose to come back and nest in the block. Others will find other nesting locations in your yard and that’s OK too! You are helping to boost the local population of native bees in your area. The females have begun their egg laying process and once you see your first mud plug, there are 5 or 6 developing bees in that hole. First year renting? If you have 10-15 holes plugged at the end of the season, your bees have done great! That means you’ll be bringing back at least as many bees as you released and have also boosted the local population of bees. Next year you can expect to see even more holes plugged. PreviousPrevious post:April inside Primrose Antique & GiftsNextNext post:Rhubarb Butter-Yum!